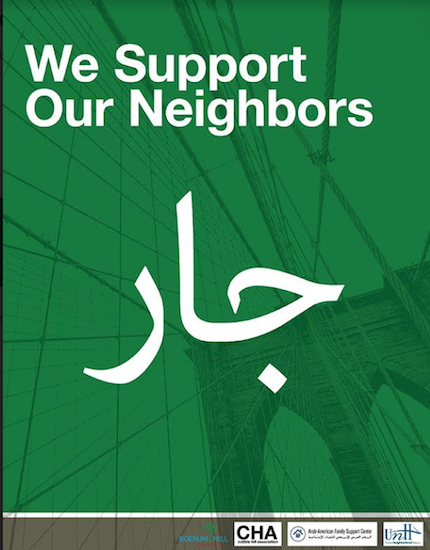 An attractive green poster showing the Brooklyn Bridge overprinted with the words “We Support Our Neighbors” in English and Arabic will soon be popping up in windows across Brownstone Brooklyn. Elected officials from neighborhoods like Brooklyn Heights, Cobble Hill and Boerum Hill, home to numerous Arabic restaurants and shops, are reporting that constituents have repeatedly expressed deep concerns about “anti-Muslim, anti-immigrant rhetoric” emanating from Washington. Now, they’ve joined with local activists to launch the We Support Our Neighbors poster campaign, designed to show positivity in this time of Trump. The poster idea was the brainchild of Brooklyn Heights resident and transit advocate Quinn Raymond. “The We Support Our Neighbors poster campaign is a simple way that neighbors can demonstrate both their opposition to these divisive federal policies and their support of all members of our communities,” state Assemblymember Jo Anne Simon said in a statement on Monday. “As neighborhoods which have been home to various Middle Eastern communities for many decades, we have deep appreciation and concern for our neighbors. At the same time, we have the freedom, and one might argue the greater obligation, to stand up for the broader community,” she added. “Neighbors coming together to support each other and lift up the community is a part of the settlement house tradition that we are proud to be a part of,” said Joseph Botros, board chairman of the Arab American Family Support Center which provides educational and social services from its offices on Court Street. Other local officials added their voices. “Our country, city and borough have long embraced inclusion as an American value — We Support Our Neighbors is about showing that should never change,” state Sen. Daniel Squadron said. “Our borough, our city and our nation were founded by immigrants. To turn against our fellow global citizens, our neighbors, during these times is to turn against ourselves,” said Councilmember Stephen Levin. “These are our neighbors, the people we live with and the local businesses that we patronize, that contribute to the great diversity that makes us who we are as Brooklynites,” Cobble Hill Association President Amy Breedlove said. The idea is also backed by United Neighborhood Houses. Posters were set to be available at the offices of elected officials and other locations late Monday.